Here's a site with a really good video tutorial on wearing Panchakachcham. 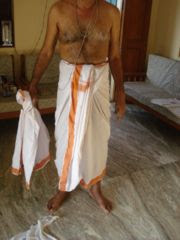 In case, that link doesn't work, try http://www.pradosham.com/home.php and you'll find the link under the section - "Do not miss this to read". Samastha Sukhino Bhavanthu) is the essence of Indian philosophy?